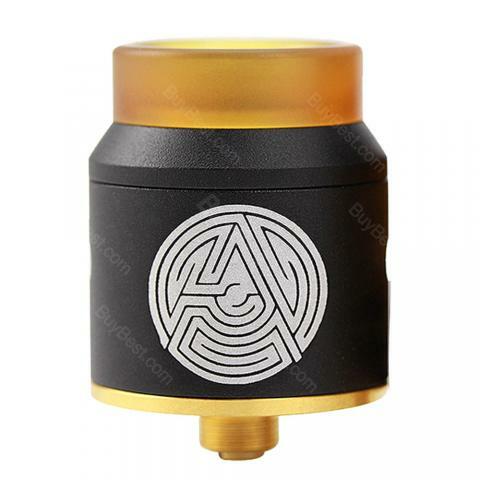 Advken Artha RDA is 24mm in diameter with well-made SS construction, which features dual-post design for easy building. The 810 PEI drip tip brings amazing flavor too! The Advken Artha RDA is a 24mm rebuildable dripper tank which is constructed with high quality stainless steel. The Artha is durable as well as providing an outstanding performance. The side airflow control of Advken Artha will bring a smooth flow to the coils too. With a BF pin, Advken Artha is compatible with most bottom feeding MODs. The gold-plated deck and dual-post design makes building easier than ever before. Advken Artha also comes with a 810 drip tip for an amazing flavor! Notice: UK Edition comes with a rubber ring. • UK Edition comes with a rubber ring. Advken Artha RDA Atomizer works totally fine, it was a hassle free deal. Advken Artha RDA Atomizer ist wirklich super und sieht auch richtig edel aus! Vor allem in der Tasche!